From September last year through to February it was my very great pleasure to take some time off for travel through South East Asia and the Pacific, accompanied by my darling wife with whom the trip had been several years in the planning. We called it "The Omnijaunt". The itinerary: Japan; Thailand; Vietnam; Singapore; Indonesia; Hong Kong; New Zealand; Fiji; and Singapore once again. Rather too long a period of time to be considered a holiday, so I wanted to keep my hand in on an occasional basis. And bearing in mind the warmth with which I have been welcomed by colleagues in Europe and North America I was keen to reach out to cartoonists where I could find them in the countries included. We started in perhaps the most cartoon-literate nation on Earth. I fulfilled a long standing ambition with a visit to the Studio Ghibli Museum in Mitaka. Tickets are like hens’ teeth and must be bought well in advance of a visit but it’s well worth it for any fan of animation. Photos are forbidden once inside but suffice it to say that every detail of the space is exquisitely designed. The temporary exhibition during our visit (which I note has been extended) concerned the portrayal of food and drink in the studio’s films, one of the things Hayao Miyazaki and company excel at and very appropriate given the sensational gastronomy that was to come. The gift shop there could have bankrupted us several times over but, so early in the trip and with sorely limited baggage allowances to come, common sense prevailed. Outside the museum at Mitaka. Later we were able to meet caricaturists Tomoko Ogawara and Koji Akihisa of Hoshinoko Production. I was very pleased to spend an afternoon with Tomoko’s students at the Hoshinoko HQ in Nerima leaving with a brick-sized pile of caricatures. On hand too was American caricaturist Dave ‘Bippy” Boyer, a huge fan of all things Japanese. We also visited some of the company’s professional caricaturists at work in Yokohama. Japanese caricaturists have been setting the pace for the rest of the world for some time. It was very intriguing to see the techniques employed, particularly their approach to colour, something the majority here in the UK do not concern ourselves with when drawing live and at speed. 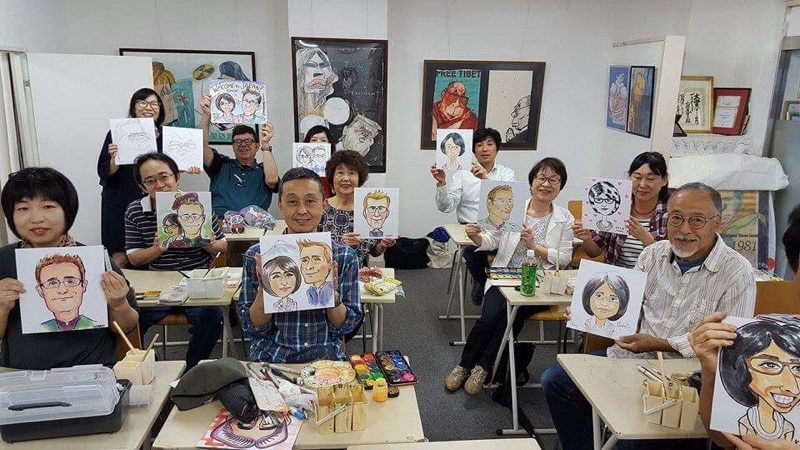 At work with caricature students in Nerima. One of Hoshinoko Production's shopping centre concessions in Yokohama. Showing some young caricaturist Umasen how it’s done in Scotland. Another addition to the parcel of artwork to be sent home! Fewer opportunities presented themselves in Thailand than I’d hoped; still in official mourning for the late King Bhumibol the whole county seemed a touch more subdued than we had anticipated. But things got back on track in Vietnam, drawing Hallowe’en party-goers in Cat Ba, flood-bound hotel and coffee shop staff in Huè while we were pounded by Typhoon Damrey and more young hotel staff and their guests in Ho Chi Minh City. While in Saigon that I was able to make a very welcome connection with several local artists thanks to the wonderful Toa Tàu school, founded by former graphic novelist Do Huu Chi. A busy Saturday there saw me drawing for visitors and being drawn by Chi and his team, even when a monsoon rain brought a power cut with it. I was particularly pleased with my wee portraits by Cuc Cu Nguyen and Thuy An Chim Xanh. Lending a hand in Saigon. In a caricature head-to-head with Chi. Cuc and Thuy's coloured pencil and watercolours were utterly charming. Little "chibi" drawings are easier to take home! In Singapore we dropped in on Jerry Hinds who runs the Association of Comics Artists there and got some great insights on cartooning and the commercial art scene in this tiny, prosperous country. 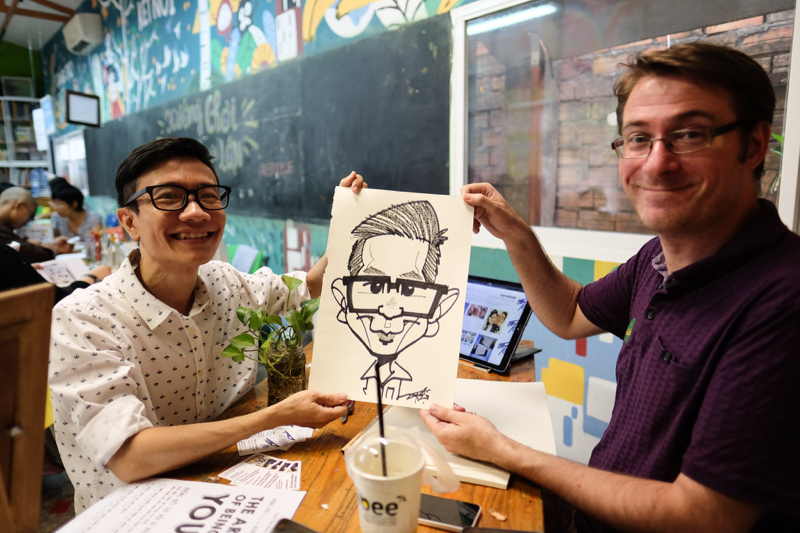 Later I tagged along with Adam Chua to a live caricature gig for one of his larger corporate clients and was astonished by his work ethic. He was in the midst of moving offices but never the less he was able to show me some of his company’s digital work and I sat in on an interview he had with the city’s largest Chinese newspaper. We compared notes on how caricatures are received by people in our respective parts of the world and found we have a lot in common. Comparing notes with Adam, probably the fastest caricaturist I've ever met. I had hoped to meet some of the artists from Bali’s Bog-Bog satirical magazine but plans were altered as we found our visit to the island coinciding with Mount Agung’s eruption. We stayed safe throughout and enjoyed ourselves anyway, although we lost some time on what would in any case have been a short visit to Hong Kong. Once in New Zealand we faced far fewer obstacles. I was very honoured to be invited to address the guardians of NZ’s Cartoon Archive at the National Library, Wellington at the conclusion of their 25th anniversary year. Hannah Benbow, Ian Grant and Oliver Stead were very generous with their time, especially so close to the Christmas summer holidays. Afterwards it was our pleasure to get better acquainted with local political cartoonist Sharon Murdoch and graphic novelists Dylan Horrocks and Sarah Laing. I was interviewed by Radio New Zealand around the same time and it's still available online. The NZCA's newsletter following my talk in December. Over the Christmas and New Year period I drew at a handful of small events. Then in Auckland we took a wander up to see Ryan Cooper and Alex Leighton of Mukpuddy Animation. They too were in the process of settling into new premises, so it was very good of them to spare the time. 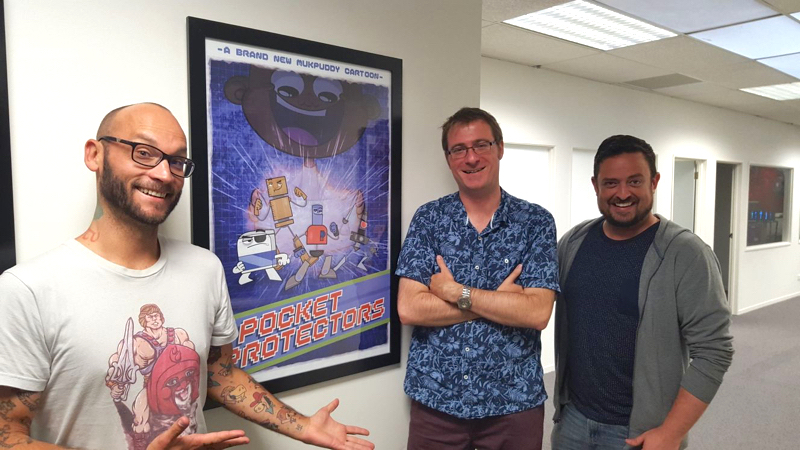 I’ve adored Mukpuddy’s stuff for years and it was great to see the company, a three-man affair for as long as I’ve followed them, welcoming a whole new gang of animators as they prepare to take on their first international production. I wish them every success. Mukpuddy are NZ’s Aardman and there’s no reason they can’t have that kind of impact around the world. Checking out Mukpuddy's new digs. Things wound down from there but there was a little more drawing to be done on Fiji as the passing Cyclone Fehi made for wet weather and some disappointed kids looking for indoor activities at our hotel. Travel is a ridiculous luxury taken for granted by too many who easily forget their privilege. That said: if you can, do it, and without hesitation. Cartooning truly is an international language. It has power. Most people everywhere are good. I don’t think it’s a coincidence that the only real unpleasantness we encountered anywhere was the fault of white men with chips on their shoulders. The planet is fragile and requires better stewardship but there’s a whole third world a-coming’ who vastly outnumber the first, want everything it has enjoyed and don’t want to hear about bans on single-use plastic, fracking and the rest. That is the greatest problem we face (and yes, I appreciate the irony in coming to this conclusion after several long-haul flights). NB - the photos above taken at Toa Tàu are the work of the wonderfully talented Quang Tram.